- Ryan Hall talking to the Chicago Tribune's Phil Hersh. Economics: What happen if every US citizen spent $5000 at the same time? Mary Wittenberg Talks To Runnersworld The interview is full of lots of great info. i. She hints that another international and a US star will drop out of a fall marathon soon. We wonder who it will be? ii. She reveals she's wining and dining the potential NY stars of the future, as Lisa Koll, Molly Huddle, Chris Solinsky, Matt Tegenkamp and Evan Jager will watch NY this year. iii. She reveals Galen Rupp has been banned by Alberto from attending. The Fastest Running Couple In The World? The WSJ Profiles New York Contenders Gebre Gebremariam And Werknesh Kidane The WSJ is suddenly full of running articles. We loved this quote from Kidane on her start in the sport: "I run to get the sheep, to get the goat, to follow with them very fast, but I don't know the meaning of running." UK Athletics Head Warns Govt. That London's Bid For 2015 World Championships Is Being Undermined By Lack Of Govt. Guarantee We have no idea why they'd need a govt. guarantee given the fact that all of the facilities will be there from 2012. Story Of The Week!!! 4 college cross-country teammates from UMBC went up to NY to watch the 5th Avenue Mile. Before the day was over, they were holding the finishing tape and hanging out with some of their heroes. How did it happen? A GREAT read. Hormone Drugs Are Apparently Starting To Impact Caster Semenya At least it's clear now the IAAF just didn't let her come back without doing something. A Look At The Two Men Who Will Represent Kenya In The Marathon In Delhi One loves India, as he's a two time Mumbai marathon champ. Four Years After Just Missing Out On Commonwealth Selection, Collis Birgmingham Goes In 2010 As Seasoned Veteran He missed out on Commowealths but improved enough to make the Olympics and WChamps. South Africa's Olympic Silver Medallist In Long Jump, Khotso Mokoena, Is Cleared To Compete He had thought it was doubtful he'd be able to go, but his injury has improved. Random Fact Of Day #1 English Hurdler Is Son Of Baronet A baronet is called "Sir" like a knight. European Silver Medallist At 200m, Christian Malcolm, Thinks Commonwealth Games Will Be Tougher Than Europeans He may be right, as the Jamaicans weren't in Europe either. Pakistani Athletes May Or May Not Get To See Taj Mahal Like Other Athletes Apparently, most visas for Pakistani are just city-specific, so they may not get to go. Ryan Hall Pulls Out Of Chicago Marathon Philip Hersh of the Chicago Tribune broke this story. Hall isn't injuried; he's just had some subpar training and is out after his subpar race in Philly. We're surprised. Pat Butcher: Patrick Makau Is Now The Man To Beat In The Marathon He's certainly the #1 in the world in our minds so far for 2010. South African Olympic Head Says He's Willing To Personally Clean Toilets To Insure India's Commonwealth Games Go On This guy clearly isn't afraid of getting his hands dirty and doing the grunt work. Certainly much better than what could be said of the old AAU guys. Snakes, Stray Dogs & Monkeys Are Last Set Of Problems To Be Dealt With By Organizers Rojo has been to India and he found the dogs to be friendly and had his picture taken with a monkey. We're not so sure about a 10-foot cobra that was found at the tennis venue. Commonwealth Games Head Says, "Don't Blame Me"
***** **** Wins Berlin Marathon In Sprint Finish In 2:05:06 (Warning: We're about to reveal the winner's name) Despite rain, Patrick Makau won the race in a sprint finish in 2:05:06 over Geoffrey Mutai as Bazu Worku was close behind. The rain prevented a world record attempt, but Makau has established himself as a marathon star. Aberu Kebede won the women's race by over a minute in a slow 2.23.58. Toronto Waterfront Marathon: Kenneth Mungara (2:07:57) And Sharon Cherop (2:22:42) Both Break Kenyan All-Comers Record At Scotiabank Toronto Waterfront Marathon Canadian Reid Coolsaet ran 2:11:23 to make the Canadian Olympic standard by 6 seconds. Sharon Cherop got the women's winby 1 second over Tirfi Beyene with 2:22:43, which was faster than the winning time in Berlin. Stop The Presses: Say it Ain't So: Menjo Loses At Lisbon Half Marathon, Mary Keitany Romps Races need to do a better job of promoting Menjo. 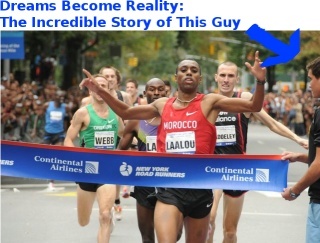 We had no idea the LetsRun.com superhero was running. In case you have no idea what we're talking about, Menjo earlier this year soloed a 3:53 mile, a 12:55 5k, and the world-leading 10k. Kara Goucher Gives Birth To Colton Mirko Goucher Congrats to Kara and Adam. Mom and baby are doing well after the baby was face up during delivery. The baby was 5 days early, which means Paula Radcliffe's second child is due in 5 days. Galen Rupp Gets Married We can't believe no one has posted on it yet, but the wedding was yesterday according to the wedding website. Congrats to Galen and Keara. USATF Board Gave Logan $140,000-A-Year Pay Raise 9 Days Before Starting Termination Process If you're thinking of terminating someone, it's probably not a good idea to bump their base pay which their severance is calculated off of. The AP article above is excellent and has the 3 criteria the board wanted to see more from Logan on. "The only amateurs left in the Olympic movement are the people running it." That's what Philip Hersh, the pre-eminent Olympic writer in the US, commented after hearing about the Logan raise. Previous Berlin News: From Bored With Running As A Child To Berlin Marathon Contender This IAAF piece has an interesting look at Germany's top contender for Sunday's Berlin Marathon, Sabrina Mockenhaupt. *Patrick Makau And Geoffery Mutai Hope To Take Up Where Haile G Left Off The two 2:04 guys certainly should like Berlin's super-fast course. A Must Click Photos Of Athletes' Bathrooms Leaked Warning - this is kind of gross. Kenyan Delegation Is Happy With Accommodations They don't want to join "team of pessimists." Boaz Lalang Not So Sure: "You don't know who might be shot or attacked." Laughable: Jamaica's World Championships Silver Medallist In Decathlon Pulls Out Due To "Dehydration"
Ryan Who? Chicago Adds 2009 Boston Winner Deriba Merga As Well As 20-Year-Old 2:05:23 Guy Feyisa Lelisa To Field We wonder if these two are replacements for Hall. It's crazy to think they both could have been without fall marathons. Lelisa blitzed a 2:05:23 this spring at age 20. Ryan Hall Talks Extensively About Why He's Not Running Chicago His long tempos were getting worse instead of better and it's clear he's been having doubts for a while, yet less than two weeks ago, he told the Philly Inquirer he thought he was in better shape this year than last. 20 Groups Demand Boycott Of Commonwealth Games "We want schools, not stadiums." Commonwealth Games Start Sunday But Some Timing Systems Still Aren't Installed Also the games chief doctor is out of action with typhoid. World Champion Ezekiel Kemboi Leads 18 Mid-D & Distance Kenyans Into Battle At Commonwealth Games Kemboi is the team captain. Men's 1500 Final Called #1 Must Watch Event By New Zealand Paper It's probably the event will be most interested in as well. Jefferson The Dog Talks In Depth About His Marathon World Record 4:45 is the new marathon world record for a mascot. IAAF Release On Jones' And Samuelson's Return To Chicago Jones' courageous 1:01:40 first half in 1985 is still legendary. Caster Semenya Out Of Commonwealth Games With Back Injury, World Champ Mbulaeni Mulaudzi Likely Out As Well, As He's Battling Back Injury The games have lost a ton of high-profile athletes for various reasons, but these 2 appear to have legitimate injuries. *Indian Government May Snub Prince Charles From Opening Games Because Queen Didn't Come For First Time Since 1966 The Queen is 84 and decided not to come and the Indians feel snubbed. 53-Year-Old Joan Benoit Samuelson Hoping To Qualify For Olympic Trials In Chicago 2:47 is going to be very hard for her and her #1 goal is to break 2:50 for the third time as a 50-year-old. Boston Globe Olympic Writer Confused Over Why Board Gave Logan A Raise Before Firing Him So were we. Recommeded Read TFN Interview With Arkansas Sensation Dorian Ulrey The Razorback senior is pumped for his final year and reveals he is considering a move to the 5,000. People seem to forget this dude has run 3:35 in the 1,500 and was 6th at NCAAs in XC - that's near Alan Webb in terms of talent in our minds. A Brief Chat With Leo Manzano In the middle of the summer, he was wondering if pro running was his calling. Now he's realizing he's got the "coolest" job in the world. 4 Kenyans In Japan, Including 2010 World Junior XC And 1,500 Champ Caleb Ndiku, Break 13:30 A 13:26 for Ndiku is pretty good for a 17-year-old. It's Official - European Marathon Champ Viktor Röthlin Is Running ING New York City Marathon We reported that Röthlin was running two weeks ago but it's official now. He leads the European charge which also includes French national record holder Christelle Daunay. Jefferson The Dog Breaks Mascot Marathon World Record In Toronto He ran 4:15.03 to smash the old record. Mo Farah Looking For Even Bigger Things In 2011 "I am just starting to scratch the surface of what I can achieve." *Recommended: Great NY Times Profile On Leo Manzano Leo talks about turning around his 2010 season and growing up very poor (his parents didn't really understand what it meant to go to college). *Lengthy Profile On Nick Willis, His Upbringing In New Zealand And This Sunday's 5th Avenue Mile Written by a Kiwi who saw Nick run a race at age 7 (the article talks about Nick's family and how his mother died when he was 5). Leonard Komon Runs 26:44 WR He smashed the old record but famed coach Renato Canova tried to put it in perspective, as the 10k on the track and roads has become much less of a priority recently. *Men's Results: Stanford Men Defeat Arkansas, NAU NCAA 5k champ David McNeill got the win as NAU sat 3 guys. OSU: OSU Men And Women Win Cowboy Jamboree (German Fernandez 6th) The Cowboys ran as a team except for ringer transfer Girma Mecheso, who won the meet (Mecheso won the SEC as a freshman 2 years ago at Auburn before transferring last year). Roy Griak: Men: Duke Men Defeat NC State, New Mexico, BYU At Roy Griak New Mexico had 3 before Duke's 1st but could only finish 3rd. Recommended Read Amazingly, Sydney Maree's Record From Year 1 Still Stands Maree got the record just 17 days after he beat Steve Ovett on the track in a year where Ovett and Seb Coe traded the mile world record. Dan Huling: "I was on track to break the American record in steeplechase this year ..." Huling is looking to go sub-4 for the first time in Manhattan. 2008 NCAA Champ Hannah England Is Enjoying Her 1st Year As A Full-Time Pro She, like Nick Willis, will be running Commonwealths. RR: Bernard Lagat's 4-Year-Old Son Is Tired Of Dad Losing Races But he's being taught early how to lower expectations for Americans on the world scene, as after Lagat got the AR but lost, he said, "Daddy lost but you're still good in the country, right, Daddy?" Newsweek: The Case Against College Athletic Recruiting We must admit we don't get why totally obscure sports get supported at the Ivy League level, but then again, some might say track is obscure. No mention though of how athletes might succeed better after college. Gags (Frank Gagliano) Has Started Another Training Group From the Reebok Enclave to the Farm Team to OTC and now an unnamed team in New Jersey. It seems like every prominent East Coast grad is in the group, including Erin Donohue, Rob Novak, Julie Culley, LBP and Max Smith. A Preview Of Next Sunday's US Marathon Men's Marathon Championships & US Women's 10-Mile Champs 2008 champ Fernando Cabada will battle it out with Minnesota native Luke Watson in Minnesota. Flanagan & Koll Going Gaga Over Each Other On Twitter Meanwhile, we thought about changing the motto of LRC to "We don't tweet." Authorities On Alert For Possible EPO Substitute The drug is called Hematide. Cape Town Missed Internal Deadline But Wants To Bid For 2020 Olympics They'd seem to have a much better chance to win than Durban. LRC Meseret Defar Wins As Shalane Flanagan Runs 68:36 2004 Olympic 5,000-meter champ Meseret Defar's move up to the half marathon was a successful one as she defeated the hottest road racer on the planet in a sprint finish to get the win, as Shalane Flanagan became the 4th-fastest American in history. Weird: Pro Meet In Kawasaki, Japan Has No Distance Races You'd think given the Japanese love of distance running that would be the highlight. Instead, it was highlighted by Christophe Lemaitre in the 100m. LRC Week That Was: Amine Laalou Vs. Bernard Lagat, Alan Webb Vs. Nick Willis, Sara Hall, Joan Benoit, Menjo And Makau We've got it all covered. Alan Webb gave himself a C+ for his performance this weekend. We're giving our Week That was an A-. Freedom Run 5k, 10k, Half And Marathon This race has been doing some local advertising with us and today we were checking out the race website. We knew race director Mark Cucuzzella was a LetsRun.com fan and the race is in some incredible beautiful and historic scenery (the marathon goes through 4 national parks: Harper's Ferry, C+O Canal, Antietam and Potomac Heritage Trail Park. LetsRun.com foreign visitors - think Civil War sites). We didn't know Mark has run at least a 2:35 for the marathon 22 of the last 24 years, including a 2:34 in Boston this year. Pretty damn impressive. As for the race, there is a kid's run, 5k, 10k, half marathon, and full marathon, but everything is sold out this year except the full marathon. And the prices are super reasonable. $25 for the 10k, $40 for the half, and $70 for the marathon. The marathon is $75 now and there are a few spots left, but you'd better be ready as the race is this Saturday, October 2nd. If you can't make it this year, it seems like a race to consider next year. Short youtube clip on the race to the left, more info here. Race director Mark is an MD, a Lt. Col in the Air Force, and also has a minimalist shoe store. We think that really is a first (the race didn't pay us for or approve this post, but they are one of our advertisers). 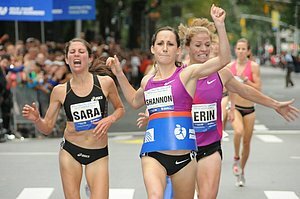 LRC Recap: Shannon Rowbury Caps Season With Win In NY Many people expected Shannon Rowbury to repeat on Sunday on the streets of New York but she had a tough brawl with New Jersey's finest, Erin Donohue. Rowbury won last year and used her road skills to time her kick perfectly. 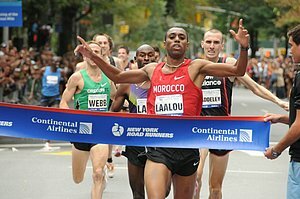 Men: Amine Laalou Earns Some American Respect Amine Laalou had the top 800 and 1,500m times coming in, but everyone was focused on the strong American contingent. All the main contenders, including Bernard Lagat, were there with 100m remaining, but Laalou got the win.